Wilmington, DE – A scheduled hearing was called off yesterday after the Delaware Board of Medical Licensure and Discipline reached an undisclosed agreement with Panzy Myrie, the owner of two Delaware abortion clinics that had ties to accused murderer Kermit Gosnell. Authorities had sought a cease and desist order against Myrie, the sole owner of two Atlantic Women’s Medical Services abortion clinics in Dover and Wilmington, who had portrayed herself as a medical doctor in clinic advertisements even though she holds no license in Delaware. Instead, Myrie plans to place the clinics up for sale and “move on.” The two clinics have been closed since March and will not reopen. Both clinics were members of the National Abortion Federation, an association of particularly troubled abortionists and dangerous abortion clinics. The NAF suspended the clinics’ membership only after embarrassing details of abortion abuses there were reported by the news media. 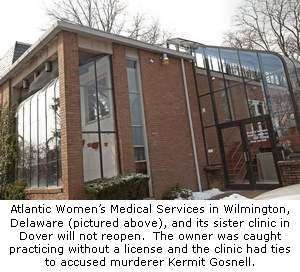 Kermit Gosnell, a Pennsylvania abortionist who is being held without bond on eight murder charges, worked at Myrie’s Wilmington clinic one day per week. He allegedly began late-term abortions there and told patients to cross state lines to have their abortions completed at his “House of Horrors” mill in Philadelphia. Two other Delaware abortionists, Albert Dworkin and Arturo Apolinario, also had their licenses suspended for not reporting Gosnell’s illegal activities and allowing him to improperly take or destroy patient medical records that contained evidence of his crimes. Dworkin’s suspension has been partially lifted, but he still faces a formal hearing at a later date. Also postponed yesterday was a hearing on a list of violations discovered at the two Atlantic Women’s Services abortion mills. The clinics faced fines of $10,000 for the first offense and $50,000 for each offense thereafter. It is unknown if that postponement was related to the Myrie agreement. The Grand Jury Report that recommended charges for Gosnell and eight of his workers listed Leroy Brinkley as the owner of the Atlantic Women’s Medical Services clinics instead of Myrie. Brinkley owns a troubled abortion clinic in Baton Rouge, Louisiana, that once employed Eileen O’Neill. He introduced her to Gosnell, who hired her to work at his Philadelphia clinic. She pretending to be a licensed physician, and was later arrested and charged with him. It is possible that Brinkley sold the Atlantic mills to Myrie.